The next steps in creating my art dolls depend on where and how the sculptures will ultimately be displayed. 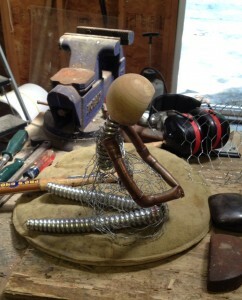 I have been working on both outdoor “garden dolls” and some new pedestal top pieces for gallery display. A garden sculpture obviously needs to be constructed to withstand the elements, and live happily outdoors. The skeleton of the figure below titled “Tend” will be kneeling in a garden space tending to the plants around her. Her dress will consist of cast concrete that will fill up the chicken wire frame. 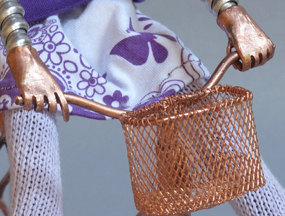 “Contemplate” is a gallery doll that is a reimagined version of an earlier piece titled “Driving in Reverse.” This steampunk styled doll has a padded wire skeleton and hand stitched clothing. 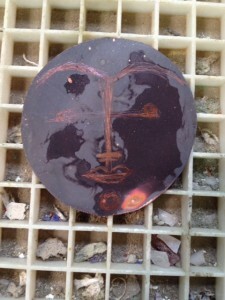 A pair of boots and some additional mechanical elements will complete this piece. 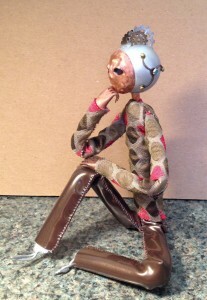 Art doll “Contemplate” thinking now about some shoes and accessories. Next time… some finished pieces to look at. This entry was posted in Art Dolls and tagged art, art doll, copper, figure, figure sculpture, garden, mixed media, one of a kind, sculpture, steampunk on August 29, 2014 by lynnadmin. Travels during July kept studio time down a bit, so I thought I’d share shots of art dolls in progress this week. I’m busy working on a couple of outdoor “garden dolls” for a fall show, and building gallery inventory back up from recent sales. 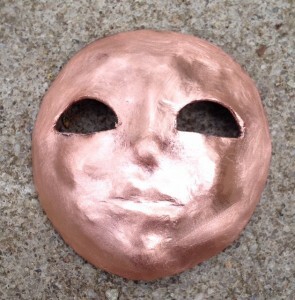 Each face starts as a disk of copper that I cut from 16 oz stock, flame anneal, and hammer into shape. 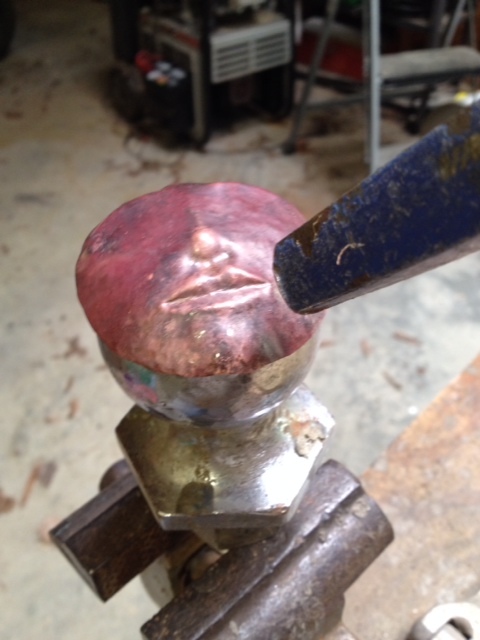 Cutting, sanding and polishing bring each face to completion. 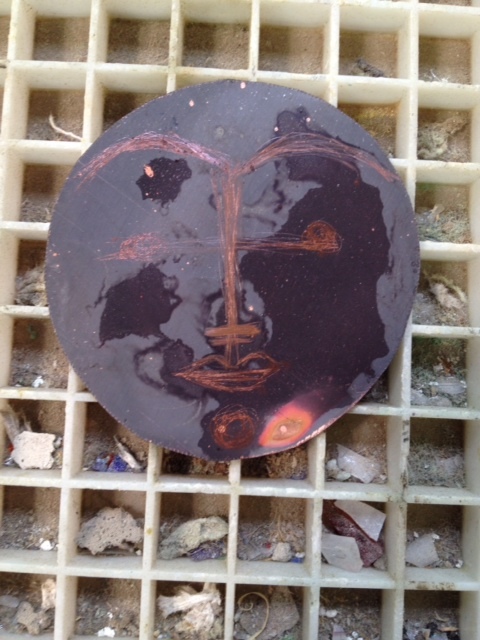 Eyes are fashioned from copper or brass headed fasteners onto which I torch fire powdered glass enamels. By mixing opaque and transparent colors I can achieve an infinite variety of colors. Hands I shape from copper tubing hammered and cut to form the sculpture’s wrist, palm, and four of the fingers. Wire brazed into a notch cut on the side of the palm forms each thumb. Next week I’ll share a few more bits and pieces. This entry was posted in Art Dolls and tagged art, art doll, copper, figure, figure sculpture, sculpture on August 11, 2014 by lynnadmin.